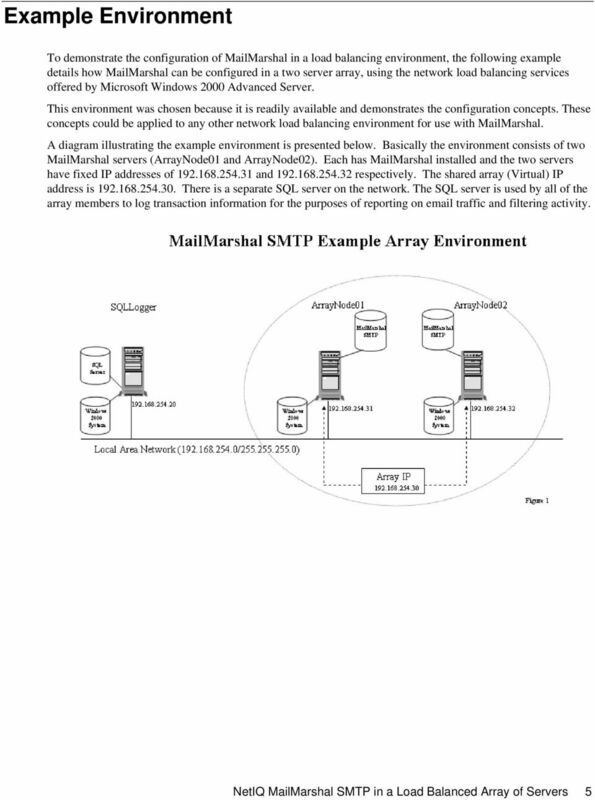 Download "MailMarshal SMTP in a Load Balanced Array of Servers Technical White Paper September 29, 2003"
1 Contents Introduction... 1 Network Load Balancing... 2 Example Environment... 5 Microsoft Network Load Balancing (Configuration)... 6 Validating your NLB configuration MailMarshal Specific Configuration Summary MailMarshal SMTP in a Load Balanced Array of Servers Technical White Paper September 29, 2003 This document is a general guide to configuring load balancing within an array of MailMarshal SMTP servers. 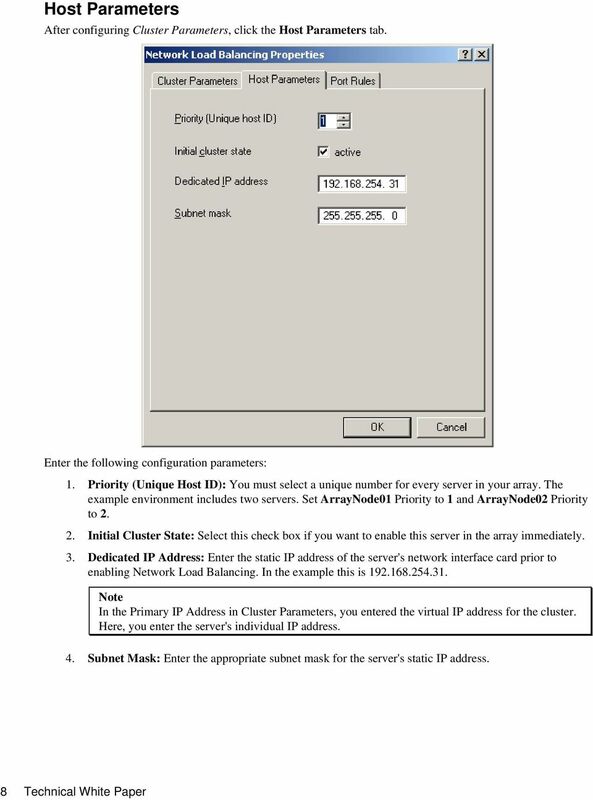 It focuses on the configuration of Microsoft Network Load Balancing for this purpose. The concepts used should assist in the configuration of load balancing in any environment. 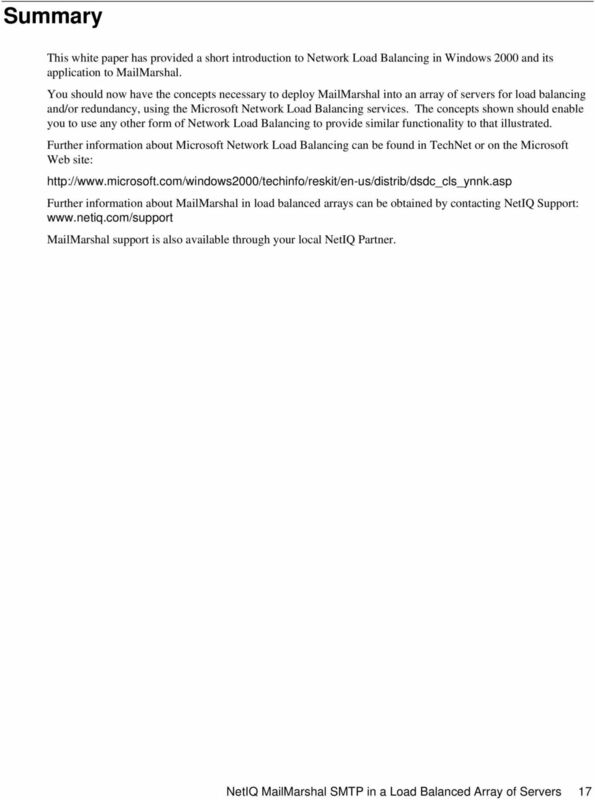 This document is not intended to be a complete or definitive guide to configuring load balancing with MailMarshal SMTP. In fact the configuration of load balancing is, in most cases, completely outside the scope of the configuration of MailMarshal SMTP. By its very nature network level load balancing is transparent to the application that is the target of such load balancing techniques. 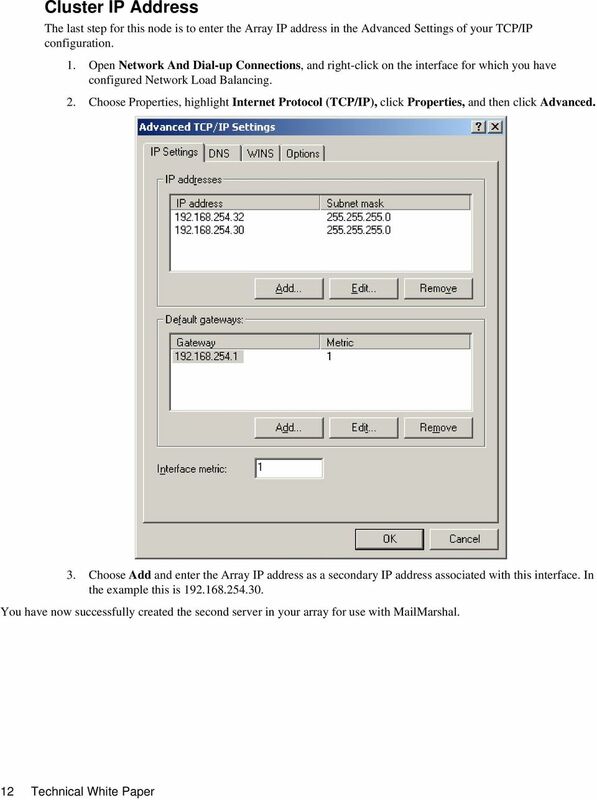 All recent versions of MailMarshal SMTP can be used in array installations. 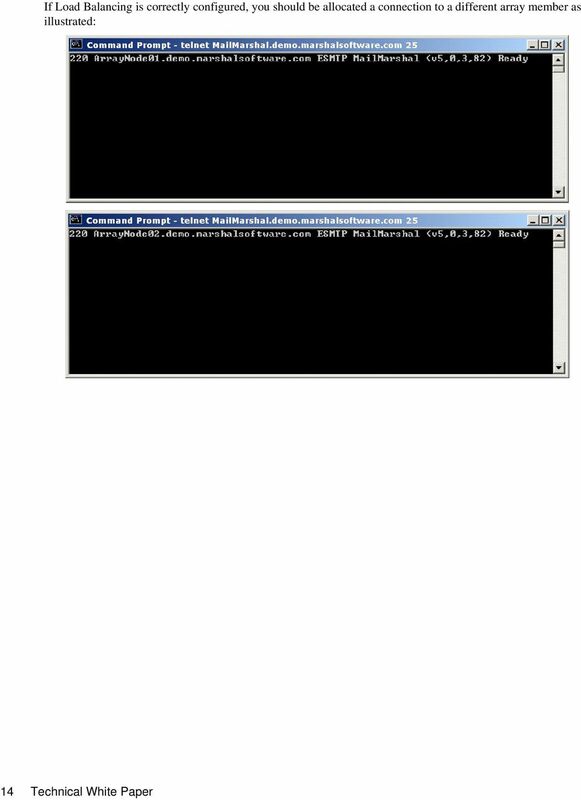 Support for centralized management of configuration and Rules across the members of an array, as mentioned in this paper, is included in MailMarshal 5.5 SMTP..
2 THIS DOCUMENT AND THE SOFTWARE DESCRIBED IN THIS DOCUMENT ARE FURNISHED UNDER AND ARE SUBJECT TO THE TERMS OF A LICENSE AGREEMENT OR A NON-DISCLOSURE AGREEMENT. 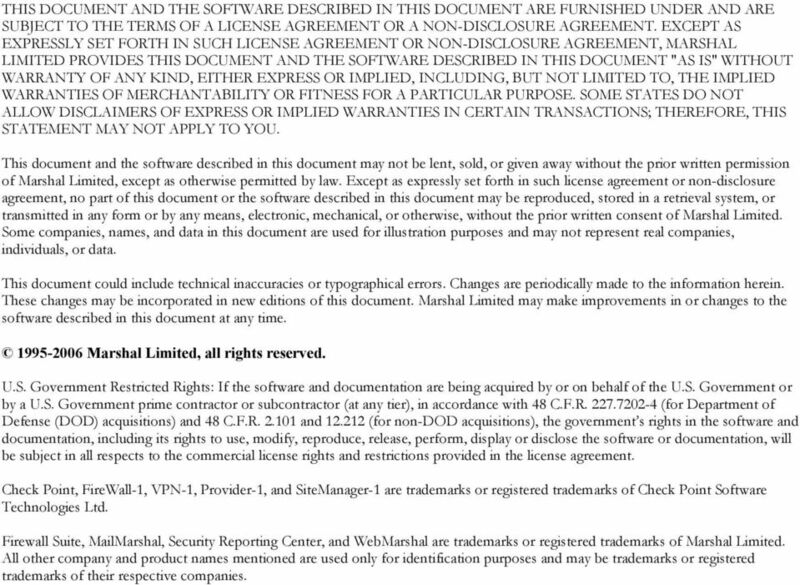 EXCEPT AS EXPRESSLY SET FORTH IN SUCH LICENSE AGREEMENT OR NON-DISCLOSURE AGREEMENT, MARSHAL LIMITED PROVIDES THIS DOCUMENT AND THE SOFTWARE DESCRIBED IN THIS DOCUMENT "AS IS" WITHOUT WARRANTY OF ANY KIND, EITHER EXPRESS OR IMPLIED, INCLUDING, BUT NOT LIMITED TO, THE IMPLIED WARRANTIES OF MERCHANTABILITY OR FITNESS FOR A PARTICULAR PURPOSE. SOME STATES DO NOT ALLOW DISCLAIMERS OF EXPRESS OR IMPLIED WARRANTIES IN CERTAIN TRANSACTIONS; THEREFORE, THIS STATEMENT MAY NOT APPLY TO YOU. This document and the software described in this document may not be lent, sold, or given away without the prior written permission of Marshal Limited, except as otherwise permitted by law. Except as expressly set forth in such license agreement or non-disclosure agreement, no part of this document or the software described in this document may be reproduced, stored in a retrieval system, or transmitted in any form or by any means, electronic, mechanical, or otherwise, without the prior written consent of Marshal Limited. Some companies, names, and data in this document are used for illustration purposes and may not represent real companies, individuals, or data. This document could include technical inaccuracies or typographical errors. Changes are periodically made to the information herein. These changes may be incorporated in new editions of this document. Marshal Limited may make improvements in or changes to the software described in this document at any time Marshal Limited, all rights reserved. U.S. Government Restricted Rights: If the software and documentation are being acquired by or on behalf of the U.S. Government or by a U.S. Government prime contractor or subcontractor (at any tier), in accordance with 48 C.F.R (for Department of Defense (DOD) acquisitions) and 48 C.F.R and (for non-dod acquisitions), the government s rights in the software and documentation, including its rights to use, modify, reproduce, release, perform, display or disclose the software or documentation, will be subject in all respects to the commercial license rights and restrictions provided in the license agreement. Check Point, FireWall-1, VPN-1, Provider-1, and SiteManager-1 are trademarks or registered trademarks of Check Point Software Technologies Ltd. Firewall Suite, MailMarshal, Security Reporting Center, and WebMarshal are trademarks or registered trademarks of Marshal Limited. All other company and product names mentioned are used only for identification purposes and may be trademarks or registered trademarks of their respective companies. Enabling Remote Management of SQL Server Integration Services Michael@SchmittDotNet.com www.schmittdotnet.com Version 1.0 10/14/2010 Copyright and Disclaimers This guide is for informational purposes only. NetIQ SecureLogin 8.0.1 includes new features, improves usability, and resolves several previous issues. Installation Guide NetIQ AppManager April 2016 www.netiq.com/documentation Legal Notice NetIQ AppManager is covered by United States Patent No(s): 05829001, 05986653, 05999178, 06078324, 06397359, 06408335.